This article was written by Molly Davis, published on 31st January 2016 and has been read 1615 times. Molly Davis studies Spanish and Italian Studies at the University of Liverpool and is spending her year abroad doing an Erasmus+ traineeship in Málaga and then moving onto Palermo, Italy, to study. She is documenting everything on her YouTube channel (Molly&apos;s Year Abroad) and, inspired by our article on using your blog to reflect on your year abroad, she wrote this article about her time in Málaga during her first semester. Instead of being on a paid work placement, I undertook an internship that gave me free accommodation. Home for me was the residence of the school I worked at. I lived among the students who were very similar to my age (so I suppose you could say that I was living in students’ halls). Our residence was located in Pedregalejo, 15 minutes from the Historic Centre, and a 30 second walk from the beach! 2. Building you&apos;d like to buy? Málaga is any architecture students dream, filled with beautiful buildings from many different time periods. If I had the money, I would buy the Alcazaba (the old Islamic fortress) located in the Historic Centre. This beautiful piece of architecture is a true representation of the Arabic culture within Andalusia with fountains, beautiful archways and incredible views of the city. The best meal I had in Málaga (and perhaps my life) was in the Vinería Cervantes. This particular tapas bar is hidden away on the corner of a street near the Teatro Cervantes and, even though it is small in size, it certainly makes up for it in the quality of service and food. Like a real Spaniard, I decided to share eight different tapas plates between my friends and I was really left wanting more (TOP TIP: If you happen to stumble across this little gem, do go in and try the salmon). 4. Best value for money meal? The wonderful bar “El Tapy” offers a cheap meal for any poor Erasmus student (as most of us are). Located, again by the Teatro Cervantes (perhaps a pattern is forming here); it offers a wide range of cheap but delicious food. However, the most notable point to make is that if you buy a small beer (for €1) they bring you a plate of free tapas (it could be paella, or Russian salad or even Spanish ham). And this doesn’t happen once. Every single time you buy a small beer you get food, it almost feels like a magic trick! 5. Favourite place to shop? Calle Larios! It is the fifth most expensive street in Spain (the more you know eh) and holds some of my favourite shops, including the best make up shop… Kiko!! 6. First thing you do when you arrive? After a long and arduous plane journey, I would definitely recommend putting your suitcases down and heading straight to La Casa Aranda for the best churros and chocolate in Málaga. The good thing is, is that churros are both breakfast and dessert, so it really doesn’t matter what time you arrive! Not everyone will agree with me as there are so many amazing spots to drink, for many different tastes, but as this is an article about MY experience in Málaga I have to say that Las Tortugas Bar in Plaza de la Merced is almost like a second home. For 5€ you can buy a litre of mojito which are safe to say a lot stronger than those in the UK (thank god for the lack of alcohol regulations). Although it isn’t the cheapest, biggest or hippest bar, the staff is truly wonderful and it is the best place to meet new people from around the world. 8. Best first date location? There is a hotel next to the cathedral called the Molina Larios. They have a rooftop bar with a swimming pool and dining area that overlooks the cathedral and the rest of the city. It is perfect for an impressive first date. I arrived in Málaga right in the middle of their biggest festival of the year: La Feria. For those of you who aren’t aware La Feria is basically a weeklong festival to celebrate when the Christian King and Queen retook the city from the Muslims. Despite its very cultural and historical routes, it really is just 7 days of drinking and dancing in the streets. I hate to repeat things but I really cannot stress enough how amazing the food is at Vineria Cervantes. Since being in Málaga I must have had at least 6 farewell parties there. Go and sit on the Alcazabilla and just absorb the cultural significance. Within one spot you can observe two different but very important time period within Málaga. You can see the Alcazaba (mentioned before) and right beneath the Roman Theatre. It almost makes you feel like a Time Lord. Clubbing isn’t really my thing; I prefer to go to bars and pubs. But I really did enjoy Velvet. The club was almost empty so my friends and I ended up being the DJ for the night and it turned into a Pop World-esque event. 13. Best place to end a night out? I can tell you where not the place to be is! Sitting waiting for the night bus at 4am on the Paseo del Parque. Some advice to myself and future Málaga goers is to take a picture of the night bus times so you don’t make the mistake of leaving the club too early and waiting 40 minutes for a bus… you could have another two drinks in that time. 14. What would you do if you were Mayor for a day? Maybe push Málaga into the 21st century and keep the shops open on a Sunday. I went so many Sundays without food because I forgot to buy it the Saturday night. 15. Building you&apos;d like to be locked in overnight? La Noria - not a building but oh well! 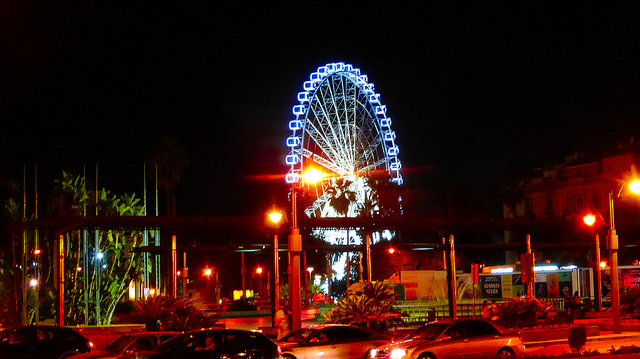 It’s the Ferris Wheel of Málaga (like the London Eye but a bit smaller). I’m sure the night views would be spectacular. September! Not scorching hot but still enough so that going swimming on the beach every day is an option. Although if you have never been to La Feria, then the end of August is a must. 17. Thing you&apos;d miss the most if you left? Well I leave in three days and the thing I will miss the most is my rugby team. I was lucky enough to join a Sports Team belonging to the University of Málaga even though I wasn’t enrolled there. These girls quickly became my family and I will truly miss them! 18. Most overhyped tourist trap? The horse and carriage tour. I am almost embarrassed to say I went on one (and it was fabulous!) But after being here for five months and seeing these horse’s everyday doing the same thing has ignited the animal activist in me. Stay clear and go for a walk instead. I don’t have many favourite expressions but I most certainly love the accent of Málaga. They don’t pronounce the letters &apos;s&apos; or &apos;d&apos;, and at times it feels like five words become one. At first it was impossible to understand but by the end of my time here I find myself picking up the accent and can&apos;t wait to go home and see how my teachers react. 20. Best way to get from A to B? Bus. Surprisingly the transport in Málaga is phenomenal (even better than England I would say). You can buy a bus card (that works the same as an Oyster Card) and that way you never have to worry about having change. After a two hour trek up Mount San Anton you will find the highest spot in Málaga. I have in fact done this climb and as tiring as it is, it is so worth it. You can eat your lunch on top of the mountain and see for miles. Apparently on very clear days you can even see Africa! 22. Who&apos;s your local hero? I don’t have one particular person but I would like to take the time to say thank you again to my wonderful rugby family. 23. What&apos;s next on your list? When I return to Málaga, I need to finish visiting all of the museums. Málaga is the land of museums and art galleries, so much so that I didn’t have enough time to visit them all! Left behind in final year?